This is an amazingly beautiful piece! This hand cast piece combines many of the elements that make Celtic art interesting, outstanding and unique! This design features the traditional Luckenbooth motifs, two hearts intertwined for love surmounted by a crown for loyalty to Mary Queen of Scots and these pieces are set with simulated gemstones. This is a truly stunning piece that is sure to draw both admiration and comments. 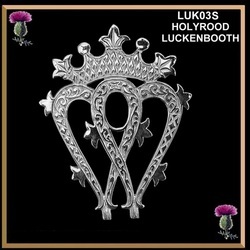 The original design for this piece one made by John Hart one of Alexander Ritchie's apprentices on the island of Iona. Measurement: 1-11/16" high x 1-5/16" wide (43mm x 34mm). The "Holyrood" Luckenbooth is available in Sterling Silver, 10K and 14K yellow gold. Select the metal you wish from our drop down menu. Sterling silver with a beautiful 10mm x 12mm oval simulated amethyst stone. Sterling silver with a beautiful 10mm x 12mm oval simulated Garnet stone. 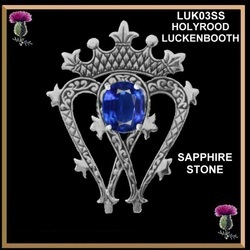 Sterling silver with a beautiful 10mm x 12mm oval simulated Sapphire stone. Sterling silver with a beautiful 10mm x 12mm oval simulated Emerald stone. Sterling silver with a beautiful 10mm x 12mm oval simulated topaz stone. Holyrood is an anglicisation of the Scots haly ruid (holy cross). It may refer to the Holyrood (cross), relics of the True Cross on which Jesus died. 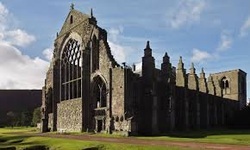 The ruined Augustinian abbey that is sited in the grounds was founded in 1128 at the order of King David I of Scotland. The name derives either from a legendary vision of the cross witnessed by David I, or from a relic of the True Cross known as the Holy Rood or Black Rood, and which had belonged to Queen Margaret, David's mother. As a royal foundation, and sited close to Edinburgh Castle, it became an important administrative centre. A Papal legate was received here in 1177, while in 1189 a council of nobles met to discuss a ransom for the captive king, William the Lion. Robert the Bruce held a parliament at the abbey in 1326, and by 1329 it may already have been in use as a royal residence. In 1370, David II became the first of several Kings of Scots to be buried at Holyrood. Not only was James II born at Holyrood in 1430, it was at Holyrood that he was crowned, married and laid to rest. James III and Margaret of Denmark were married at Holyrood in 1469. The early royal residence was in the abbey guesthouse, which most likely stood on the site of the present north range of the palace, west of the abbey cloister, and by the later 15th century already had dedicated royal apartments.